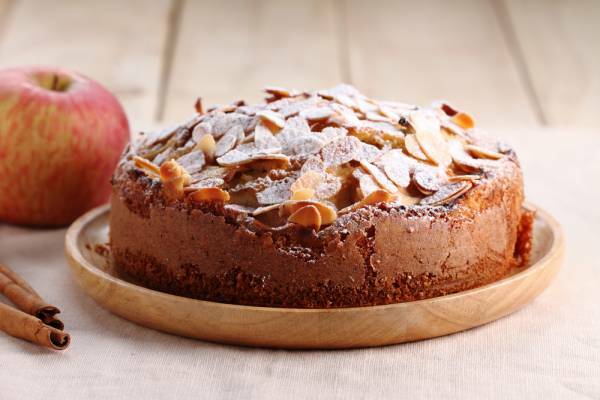 Appelkaka is a traditional Swedish cake made with apple, almonds, cinnamon and cardamom. With the 20g of butter grease and line a 20cm cake tin with a removable base. On a clean chopping board peel and dice the apple into 2cm cubes and set aside. With an electric hand mixer, beat the butter and sugar in a large bowl until pale. Add the eggs, one at a time, mixing until they are incorporated. Fold through the flour, baking powder, salt, cardamom and cinnamon until you have a thick cake batter. Stir through the apple and pour the batter into the cake tin. Spread the almonds of top of the cake and bake in the oven for 40-45 minutes. Cover with tin foil if the almonds brown too much. As the cake is cooling, heat the jam in a saucepan until runny and brush over the top of the cake. Carefully remove the cake from the tin and slice.